Issued at 2:58 pm EDT on Monday 11 February 2019. Hot, dry and windy conditions ahead of the passage of a cold front is bringing elevated fire dangers much of the state. 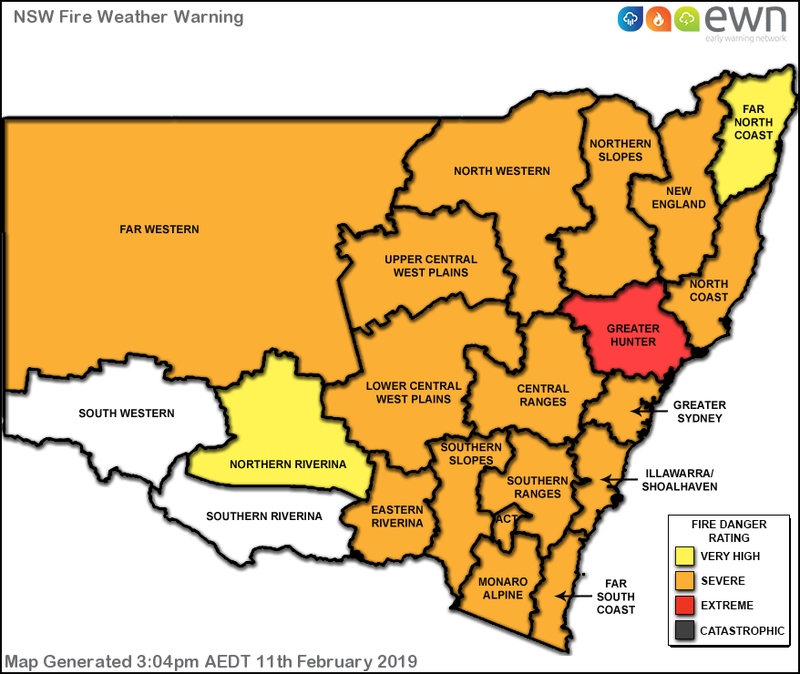 North Coast, Greater Sydney Region, Illawarra/Shoalhaven, Far South Coast, Monaro Alpine, Southern Ranges, Central Ranges, New England, Northern Slopes, North Western, Upper Central West Plains, Lower Central West Plains, Southern Slopes, Eastern Riverina and Far Western, Australian Capital Territory. Action your Bushfire Survival Plan now. Monitor the fire and weather situation through your local radio station, www.rfs.nsw.gov.au and www.bom.gov.au. Call 000 (Triple Zero) in an emergency. Prepare for the emotional, mental and physical impact of defending your property - if in doubt, leave. For information on preparing for bushfires go to www.rfs.nsw.gov.au.